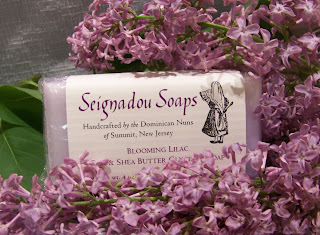 The Sisters in the soap room have been hard at work producing some lovely new soaps for Spring! We now offer Lily of the Valley, Blooming Lilac, Basil Citrus and Pink Grapefruit! How do we choose our new fragrances? It's part brainstorming and part serendipity. A Sister will suggest a soap and the reaction can be enthusiastically positive, unanimously negative or something in between. It's always fun when they bring the new soaps to recreation to get the Sisters' reactions! They usually also offer a basket of soaps for us to choose from—the duds! During the winter we had a bunch of basil in a cup on the window sill in the kitchen. 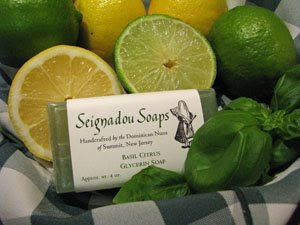 That combined with the scent of the citrus dish detergent "inspired" the Sisters to make the Basil Citrus. 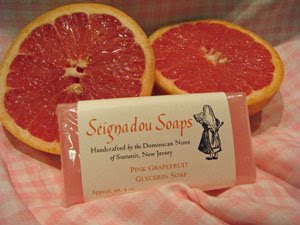 The Pink Grapefruit was the idea of one of our aspirants who is a fan of this scent for her own soap. 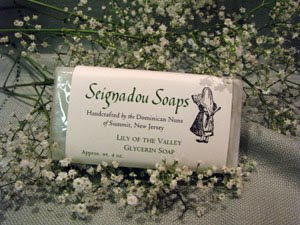 Lily of the Valley is the favorite of several of our Sisters and Blooming Lilac? What is Spring without lilacs? We are also now offering OATMEAL Scented Hand Creme! Also, we are slowly transferring to PUMPS for our hand creme bottles after many requests. We still have some of the old flip up caps so it may take a while before we are totally transferred to pumps. We hope you enjoy our news soaps! Many people have commented on how nice their skin is after using our products. Your purchase also helps support our life of prayer!